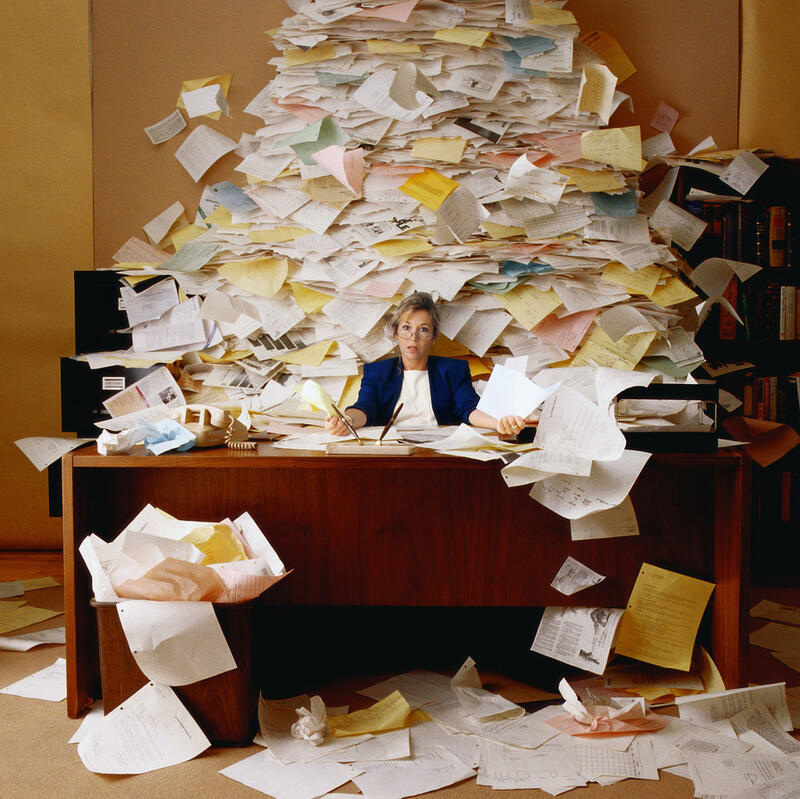 Like most of us, I tend to let papers, files and other to-do items pile up on my desk. There’s a ring left from my coffee mug, and only when the dust gets out of hand do I pull out the cleaning rags. The computer keyboard? I don’t even want to think about the germs that could be festering there! Although cleaning your workspace often doesn’t make your daily to-do list, other than a quick tidying up at the end of the day, it does have many benefits. Your workflow, your creativity and your health could all suffer from a dirty and less-than-hygienic desk. Here are some things to keep in mind which could prompt you to summon your inner neat freak and keep things clean. Just looking at a messy, unkempt workspace first thing in the morning can raise your stress levels. Not only is it unpleasant to look at, but it can also make it hard to find needed items and can slow you down. Why do that to yourself? A neat, organized atmosphere will limit distractions and help you focus on your work, not your clutter. Having a neat, well-organized desk is the easiest way ever to impress your boss and other higher-ups. Think about the image you want to portray in the office – would you rather appear pulled-together and productive, or sloppy and disorganized? A messy desk can harm your professional reputation, which is a great motivator to keep it clean and clutter-free. A messy desk can be distracting and can pull your mind off of what you should be doing: working. Keeping it clean will make it easier to focus on projects instead. You’ll also find yourself with lots more space to get things done rather than pushing the mess to the side and adding more to the pile. This also applies to clutter on your computer, like old files on your desktop or an overflowing email inbox. Take time to organize and you won’t be tempted to throw a cover over your desk and walk away at the end of the day. Sure, your office may have a cleaning service that comes through once a week, but many are not allowed to move items on desks. That could leave many surfaces untouched for weeks. Did you recently have a cold? Do you sometimes eat lunch at your desk? Did you spill a drink? Your desk could be harboring germs or mold from viruses or crumbs. Make a point of cleaning your desk and computer keyboard with the proper cleaners on a regular basis for the sake of your health. Believe it or not, there are times when having an untidy desk can actually pay off at work. A Psychological Science study found that having a messy environment at the start of a project can promote creative thinking and help people come up with new ideas. Whereas a clean working space makes the mind focus on order and on what is to be expected. If you need to come up with unconventional and new ideas, it can help to start a bit messy and finish clean. That’s good news for creative types! There are many good reasons to keep your workspace clean: your efficiency, your reputation and your health will all benefit from a neat environment. Taking a bit of time to tidy up won’t feel like a chore if it helps you get ahead.